​If you’re interested a fresh cup of coffee each morning, you should consider purchasing a drip coffee maker. This guide is the perfect place to start. In our opinion, there’s no better way to wake up than to a piping hot cup of coffee. The smell of freshly-brewed coffee, coupled with a jolt of caffeine, is one of the best ways to get your day started. 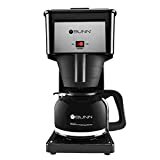 Even when factoring in that you must buy your beans and coffee machine, the cost of purchasing one of the best drip coffee makers pales in comparison to buying coffee every day. And, your drip coffee maker should last you a while. Besides the up-front cost of purchasing the brewer, there are no real other maintenance costs associated with the machine. Additionally, you’ll be able to drink multiple cups of coffee, instead of just the one you may limit yourself to when you are buying from a coffeehouse. A single brew could from one of the best drip coffee makers yields multiple cups of coffee. Your whole family could have coffee in the morning with a single brew cycle. Or, you could have a cup when you wake up and another when during your daily commute. Drip coffee is considered one of the three primary coffee brewing methods, alongside espresso and immersion. Most people find that drip coffee is lighter on the pallet, allowing brighter flavors to shine through. Fruity and floral flavors are more abundant in drip coffee than in espresso or immersion coffee, making drip coffee an excellent choice for those concerned with taste. There are two different types of drip coffee makers available, automatic and manual. For both, you’ll begin by placing ground coffee into a filter and pouring hot water over it. For maximum taste, we recommend purchasing a coffee bean grinder and whole beans. Freshly-ground beans will make for a coffee experience unlike any you’ve had before. When compiling our ratings, we consider how vital your cup of coffee is to you. That’s why we try to be fair and honest during our assessments. We’ve read many reviews and used the machines ourselves. We also researched thousands of online customer reviews and compiled data about the best drip coffee makers. The Moccamaster by Technivorm is one of our favorite drip coffee brewers. It has a 4.5-star rating on Amazon with more than 480 customer reviews. The brewer is available in 14 different colors, meaning it is easy to tie into the existing color scheme in your kitchen or bedroom. This automatic brewer features a quiet brewing process that can brew a full 40-ounce carafe in less than six minutes. The Moccamaster uses a copper boiling element to heat water to the ideal brewing temperature, which is between 196 and 205 degrees. A hot plate will keep the carafe warm for a maximum of 100 minutes. This brewer is very durable and features durable metal housings. Any plastic on the machine is free of BPA, BPS, BPF, and Phthalate. The device also comes with a five-year warranty. The brewer is available for purchase on Amazon. While this may seem steep, remember that you’ll be saving money by not buying coffee each day. The drip brewer should pay for itself in less than a year. This brewer has a 4.2-star rating on Amazon with over 1,700 customer reviews. The brewer can brew ten cups of coffee in three minutes, allowing the company to call it the fastest ten-cup home coffeemaker on the market. The brewer can produce coffee so quickly because the internal water tank is always hot so that coffee can be ready on demand. Users have the option to choose from making anywhere between four and ten cups at a time. The machine also comes with a carafe spot, which prevents splattering and messes on your counter. Reviews give credit to how good the coffee tastes, and BUNN’s customer service department. The prices for this brewer vary based on color. A black brewer , Black High-Altitude brewer and a white brewer. All three versions of the brewer feature a three-year warranty. 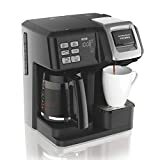 This Cuisinart drip-brewer has withstood over 3,000 Amazon interviews and still features a 4.2-star rating, speaking very highly of the quality of the product. The brewer features a strength control setting that allows you to regulate the flavor of your coffee. It also comes with fully-automatic 24-hour programmability, a self-clean setting, and auto-shutoff. Users can brew anywhere from one to four cups of coffee or 14 cups in a large glass carafe. The brewer also gives users the option to pause the brewing cycle at any time. Users can also regulate the keep-warm temperature of the coffee. Reviews of this model are favorable, with multiple reviewers calling it the best drip brewer they have ever used. This brewer is more moderately-priced. Unfortunately, it is only available in stainless steel. For those looking to start out with their first drip-brew coffee maker, this may be the option for you. The machine is for personal use, only brewing one cup of coffee at a time. However, the brewer is sleek and compact, in addition to being lightweight and portable. Transporting from location to location is easy. It also features a permanent filter, which will cut down on some of your initial costs. Reviews of this brewer were great, as it’s received a 4.2-star rating on Amazon. Of the nearly 280 customer reviews, 70% of them have been five-star ratings. It is also the cheapest option on our list, available on Amazon. It is the perfect brewer for those new to drip brewers because of its price and one-cup option. This is a great way to ensure that you don’t waste coffee. As you begin to drink coffee more and more, you can upgrade to a more powerful brewer, but for now, this should do the trick. $20 is not very expensive for a quality brewer. If you do end up upgrading brewers, you could still use the Vremi when traveling. 12-Cup carafe side: features programmable timer, auto Pause and serve and 2-hour auto shutoff. This model was one of the more interesting ones we came across. 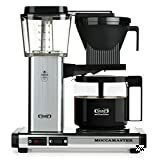 It is a two-way brewer, allowing users to brew a full pot on one side of the machine using a carafe, or by making individual cups using a K-cup or coffee grounds on the other side. The carafe side of the brewer features a programmable timer, two-hour automatic shutoff, and an automatic pause feature that allows you to remove the carafe. Both sides allow users to choose between regular or bold flavor options. There are two separate water reservoirs on each side of the tank. Reviews for this brewer are great, as it has a 4.1-star rating on Amazon with over 1,400 customer reviews. The machine is available for purchase. A manual drip coffee maker requires a little more attention. Although making a cup of coffee will not take more than a few minutes, it will still need more work than an automatic drip machine. However, manual drip coffee makers could result in a cup of coffee that tastes better, because you have more control over the brewing process. With manual brewers, one of the areas where you have to focus most of your attention is when pouring water. With a manual drip coffee machine, you have to drain the water over the coffee grounds very carefully. If you do not, you won’t utilize the full flavor of the beans. Manually brewing machines tend to be more expensive than automatic brewing machines. We recommend that if you’re buying your first drip coffee maker, you choose an automatic one. You’ll still get coffee that tastes great, but you won’t break the bank while doing so. You’ll also get the convenience afforded by one of the machines. As time goes on and you get more comfortable with the settings on your automatic drip brewer, you can experiment with different coffee beans to experience different tastes and flavor profiles. Once you have gotten accustomed to different tastes, you may be ready for a manual drip brewer. If you do not yet have an appreciation for coffee, you may be in over your head with a manual brewer.